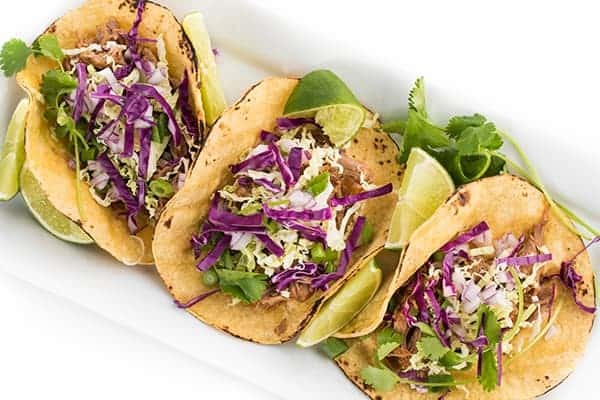 Pork shoulder is cooked in the instant pot with a sesame ginger sauce until tender in these crowd-pleasing Asian pork tacos. 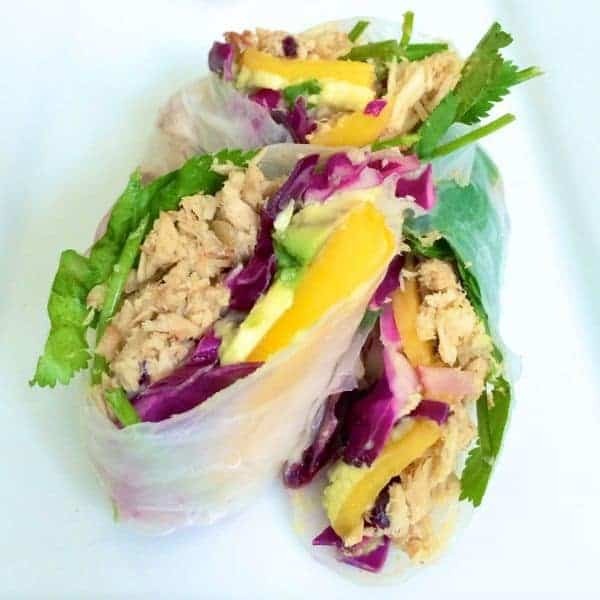 Asian food and Mexican food are two of my favorite cuisines so whenever I get the change to mash up the two, I’m all over it! 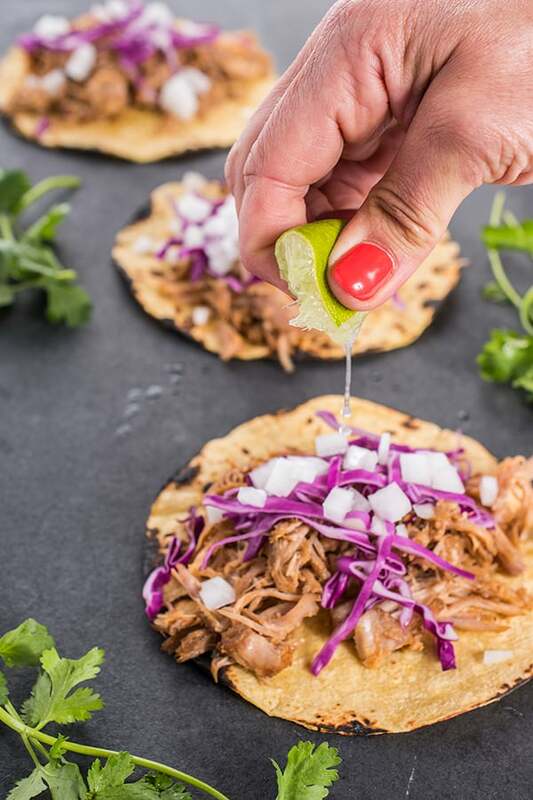 Of course, a taco is the most natural medium for Asian-Latin fusion which is what inspired these Instant Pot Asian Pulled Pork Tacos. 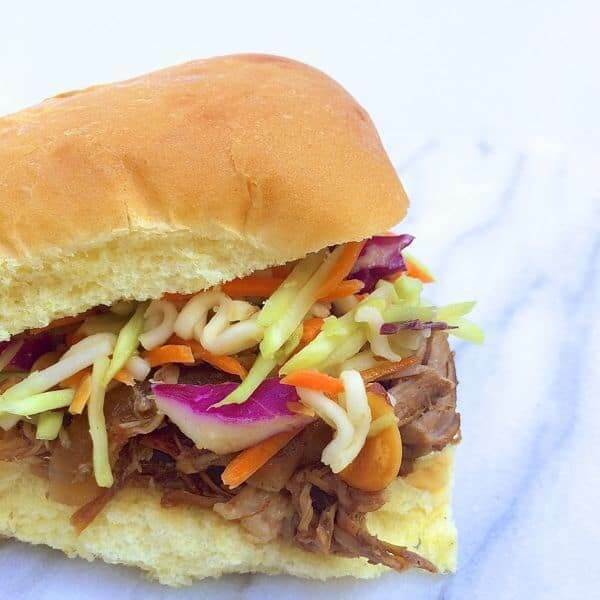 While you certainly could make these in the slow cooker, the Instant Pot does cut down on the overall cook time. It’s also great if you’re starting off with a frozen pork roast. My kids love tacos but my husband isn’t a huge fan so he typically eats the pulled pork over brown rice. If you want to keep it low carb, I love eating it over a bowl of Asian Cabbage Slaw. The pork is tender, juicy and scented with toasted sesame oil and ginger. For maximum flavor, lightly toast your corn tortillas over an open flame. Sprinkle with lime juice before serving and you’re good to go. Place pork shoulder in the bottom of the liner pot. In a medium bowl, whisk together the sauce: water through chili paste. Pour mixture over the pork. Close the lid, make sure the vent is closed then press "MEAT/STEW". Once the timer goes off, release the pressure naturally using NPR. This may take up to 30 minutes. Remove pork from pot and shred with two forks. 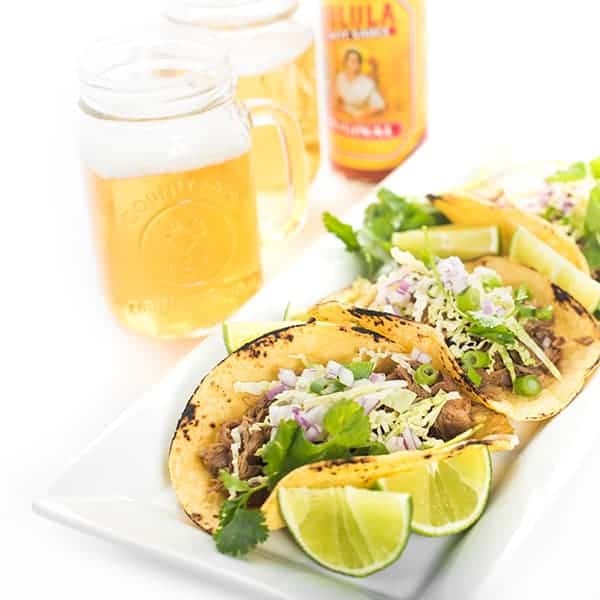 Serve with warm corn tortillas, shredded cabbage, minced onion and cilantro. 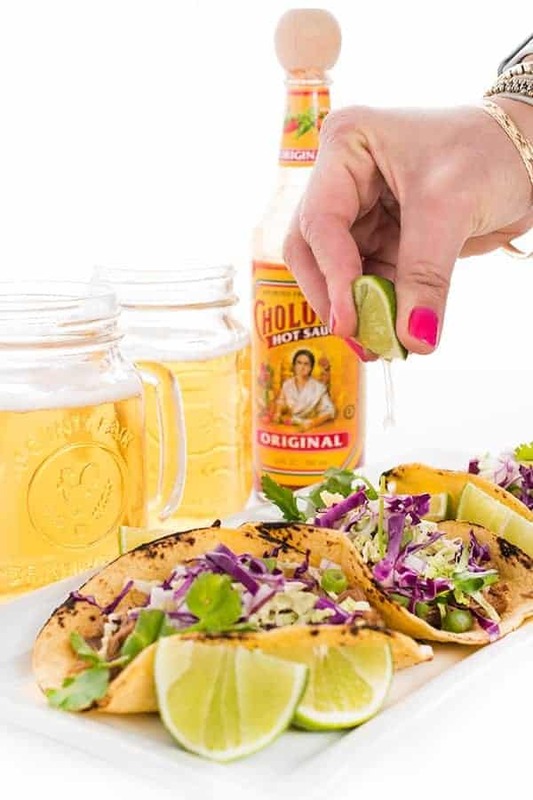 Nutrition facts do not include tortillas or garnish as those will vary by brand and type. 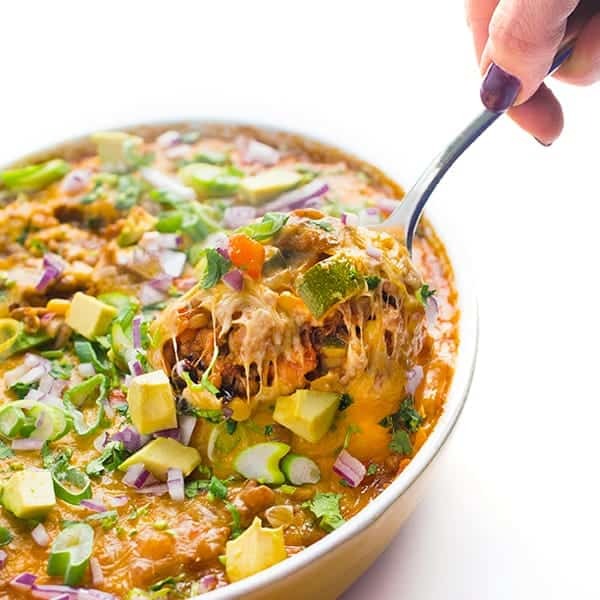 Head over to my Pinterest board for more Healthy Mexican recipes! When I printed the recipe, it says “prep time- 15 mins; NPR could take 30 mins; total cook time is 1 hour 45 mins”, so I figure the time in the Instant pot is an hour on the Meat/Stew setting. Hi you’re recipe says to put it on meat/stew setting, but there is not a time designated for how long it should be in the instant pot before releasing the pressure. What is the cook time? Hi Stephanie, On my instant pot you dont set a time it adjust automatically. So sorry I cant help. Otherwise you can do the slow cooker on high for 4 hours! 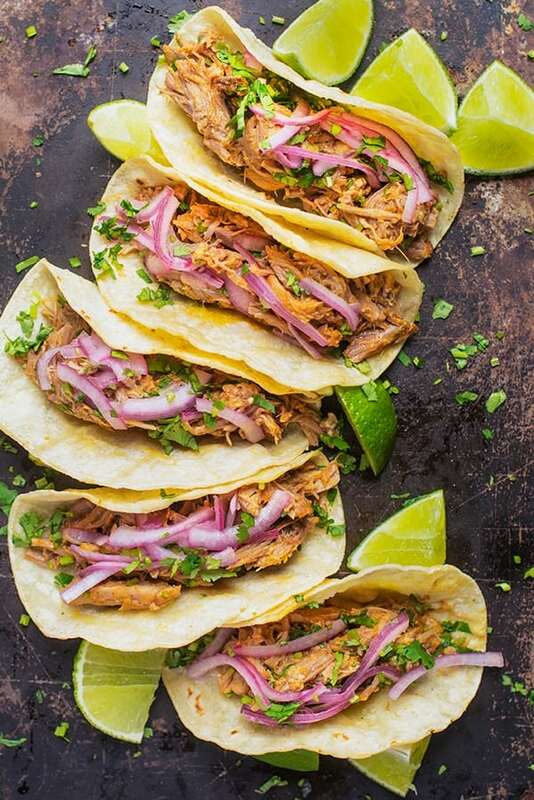 These look so good, love tacos. I’m on the fence with getting an instant pot because I have a slow cooker. Would you say the texture of the meat is the same as if cooked in a slow cooker? Thanks. Yes same as slow cooker. :) It’s just a time saver. This is so well packed dinner :-) Keeper it is ! Thank you ! 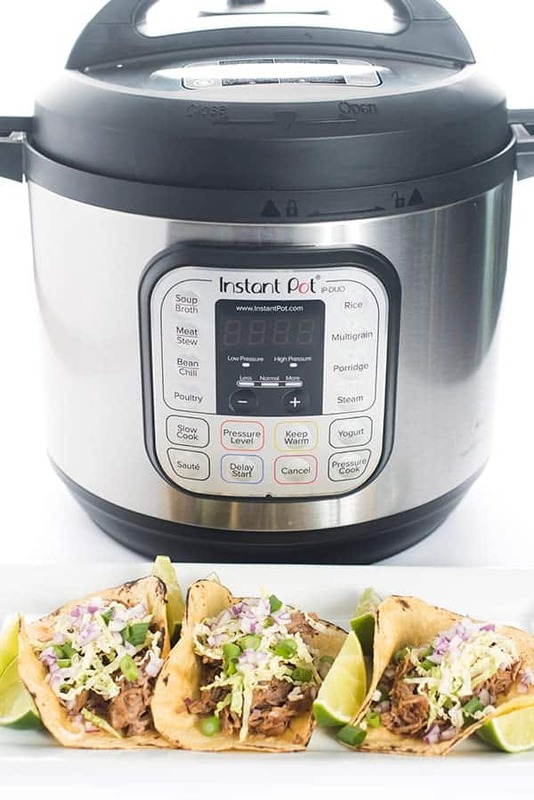 I don’t have an actual “Instant Pot” pressure cooker, but another brand that I actually have to set the time for. I don’t have a “meat/stew” setting. how long should I cook the pork for? Keep up the great recipes and the travel posts Liz. Great! you have a pressure cooker that saves loads of cooking time, and here’s a pressure cooker recipe, but instead of knowing how long to leave it in there, “use the slow cooker for hours, because I don’t know how to write a pressure cooker recipe with all the details”. That’s a bad answer. It’s been a few months. Maybe make it again, so you can figure out how long to leave it in the pressure cooker. Crazy idea. Hi Cidny, Each pressure cooker has varying instructions so I can possibly tell you how long to use it for every single one out there. The best tip is to use the “Meat/Stew” setting. Is that helpful at all? Btw there’s no reason to be sarcastic. :) I’m a human being just like you – no need to hide behind a computer and be rude. Happy New Year!